Eric Swanson was eager to ask Serena M. Auñón-Chancellor, a NASA astronaut, if she along with her crewmates were able to grow plants aboard the International Space Station. 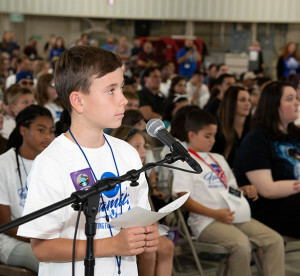 Eric along with more than 300 NASA children were virtually transported to the space station on June 28 through a live broadcast between the station and NASA’s Armstrong Flight Research Center in Edwards, Calif.
As part of the center’s bi-annual Take your Kids to Work Day, NASA families and Edwards Air Force Base students from across the Antelope Valley were invited to learn about various careers, projects and programs at NASA. However, unlike past events, this year also included a live question-and-answer session with Auñón-Chancellor, a member of the Expedition 56/57 crew that launched to the orbiting laboratory in June. For the agency, this was the first time a downlink was hosted in an aircraft hangar. Auñón-Chancellor answered several questions during the 20-minute Earth-to-space call, including how it felt to launch into space and what Mars exploration would look like. Those selected to ask questions approached the microphone one-by-one, excited to hear answers from space. 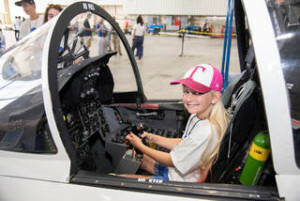 Rylee Ritter, first time visitor to NASA’s Armstrong Flight Research Center, sits in a mockup of an F-15 cockpit, during the center’s Take Your Kids To Work Day event. Along with the downlink, children were able to experience a weather balloon launch, sit in a mock-up of an F-15 cockpit, observe moon rocks through a microscope and play with robots from local robotics teams. The close-up exposure to programs and careers at NASA has already started to influence these young minds. 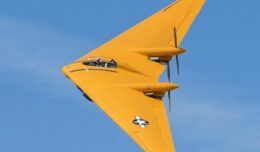 Attendee Joe Dinous now aspires to be an engineer and work on planes similar to the ones found in the hangars at Armstrong. For Rylee Ritter, joining the U.S. Air Force is what she hopes for when she gets older. Whether it is growing plants in space or gathering critical data for future space exploration, Auñón-Chancellor let Eric Swanson know how incredibly rewarding her work is being done on the space station. As for the NASA children, the experience of talking to a NASA astronaut on the space station was equally as rewarding for them.